We all know that parrots can talk. Some people may have even seen elephants, seals, or whales mimicking speech sounds. 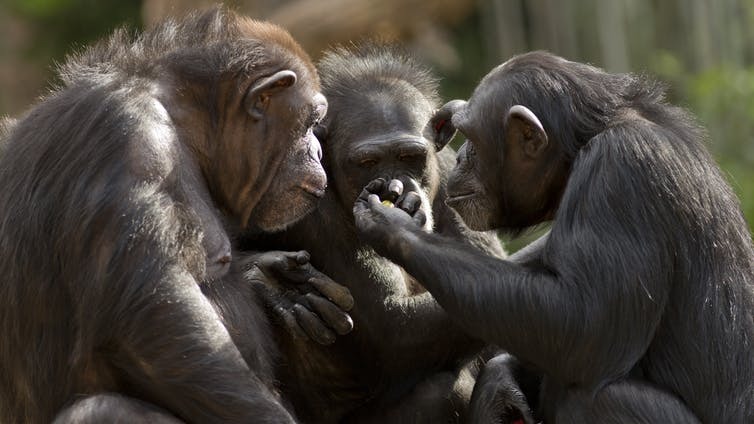 So why can’t our closest primate relatives speak like us? Our new research suggests they have the right vocal anatomy but not the brainpower to use it. Scientists have been interested in understanding this phenomenon for centuries. Some have argued that non-human primates didn’t have the right-shaped body parts to make the same sounds as we do, and that human speech evolved after our speech organs changed. But comparative studies have shown that the form and function of the larynx and vocal tract is very similar across most primates species, including humans. This suggests that the primate vocal tract is “speech ready” but that most species don’t have the neural control to make the complex sounds that comprise human speech. When reviewing the evidence in 1871, Charles Darwin wrote “the brain has no doubt been far more important”. Along with Jeroen Smaers from Stony Brook University in New York, I have been investigating the relationship between the number of different calls that each primate species can make and the architecture of their brains. For example, Golden pottos have only ever been recorded using two different sounds, while chimpanzees and bonobos use around 40. Our new study, published in Frontiers in Neuroscience, focused on two particular features of the brain. These were the cortical association areas that govern voluntary control over behaviour, and the brainstem nuclei that are involved in the neural control of muscles responsible for vocal production. Cortical association areas are found within the neocortex and are key to the higher order brain functions considered to be the foundation for the complex behaviour of primates. The results indicate a positive correlation between the relative size of the cortical association areas and the size of the vocal repertoire of primates. In simple terms, primates with bigger cortical association areas tended to make more sounds. But, interestingly, a primate’s vocal repertoire was not linked to the overall size of its brain, just the relative size of these specific areas. We also found that apes have particularly large cortical association areas, as well as a bigger hypoglossal nucleus than other primates. The hypoglossal nucleus is associated with the cranial nerve that controls the muscles of the tongue. This suggests that our closest primate relatives may have finer and more voluntary control over their tongues than other primate species. By understanding the nature of the relationship between vocal complexity and brain architecture, we hope to identify some of the key elements that underlie the evolution of complex vocal communication in our ancestors, ultimately leading to speech. The origins of speech is a topic that has long been debated. The Société de Linguistique de Paris famously banned any further enquiry into the matter in its publication pages in 1866, as it was deemed to be far too unscientific. But much progress has been made in the last few decades thanks to a wide range of evidence, such as that from studies of communication in other species, fossils and, more recently, genetics. Research has shown that some primate species, such as vervet monkeys, use “words” to label things (what we would call semantics in human language). Some species even combine calls into simple “sentences” (what we would think of as syntax). This can tell us a lot about the early evolution of language, and the elements of language that might have already been present in our common ancestors with these species some millions of years ago. The fossil record can also provide insight. Speech itself clearly does not fossilise, so researchers have searched for proxy evidence in the skeletal remains of extinct human relatives. For example, some researchers have argued that the position and shape of the hyoid bone (the only bone in the vocal tract) can tell us something about the origins of speech. Similarly, other have argued that the diameter of the thoracic canal (which connects the thorax to the nervous system), or the hypoglossal canal (through which the nerves travel to the tongue), can tell us something about breathing, or speech production. And the size and shape of the tiny bones in the middle ear may be able tell us something about speech perception. But, in general, the fossil record is simply too limited to draw any strong conclusions. Finally, comparing genetics of humans and other species has provided insight into the origins of speech. One much-discussed gene, that seems to be relevant for speech, is the FOXP2 gene. If this gene mutates it leads to difficulties with learning and producing complex mouth movements, and wide-ranging linguistic dificiencies. It was long thought that the DNA sequence changes in the human FOXP2 gene were a unique trait, related to our unique ability to use speech. But more recent studies have shown that these mutations are also present in some extinct human relatives, and the changes in this gene (and, perhaps language itself) may be much more ancient than previously thought. Technological developments, such as further ancient DNA sequencing of extinct species, and increased knowledge of the neurobiology of language, are certain to provide further giant leaps. But the future of this contentious and complex field will likely depend on large-scale, multi-disciplinary collaboration. Comparative studies like ours, comparing traits across a range of species, was the primary tool used by Darwin. No doubt such studies will continue to provide important insights into the evolution of this incredible aspect of our behaviour.